This reader did not specify what type of phone he or she has. For starters, I’m going to assume it’s running Android, by far the most popular smartphone operating system in terms of number of phone makes and models that use it. (It might seem like everyone has an iPhone, but Android actually has 85% market share.) The ability to use a phone as a WiFi hotspot is built into both Android and the iOS operating systems, so we'll go over both here. But before getting into the step-by-step, I want to caution every reader. Most phone data plans have a cap of several gigabytes per month. If you exceed that number, you may be billed an exorbitant amount for each additional gigabyte or fraction thereof. Or you may just find that you're out of data, before the end of your plan month. On so-called “unlimited” plans, you may face drastic throttling of bandwidth speeds once you exceed a certain usage. The fun part is, carriers may not declare a specific cap, but just say they reserve the right to restrict “excessive” users. I've used the hotspot feature to get my laptop online for brief periods in an airport or hotel room, but never as a substitute for a high-speed Internet connection at home. Carriers may have separate and more draconian limits on data consumption via hotspots. The assumption behind such restrictions is that multiple people will use the hotspot simultaneously, consuming a lot of bandwidth and degrading service to other users of the same cellular tower. 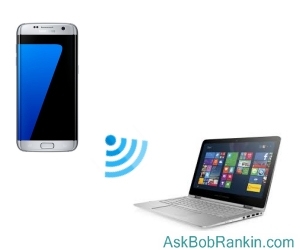 This reader asked about connecting one PC, not sharing the mobile hotspot with other devices. Nonetheless, any restrictions on hotspot usage will be in force. You might want to check with your mobile provider to see if your phone is capable of acting as a hotspot, and if there are any data usage concerns. With all that said, here are the steps to enable the hotspot feature of a smartphone running a recent version of the Android operating system. Plug the phone into its charger and the charger into an electrical outlet. Hotspot mode consumes a lot of power! Open the phone’s Settings app, identifiable by the gear icon. In the "Wireless & Networks" section, touch the More item, then touch "Tethering & Portable Hotspot". Touch “Save” or “OK” to set your changes. On one of my older Android phones, after turning on the Mobile Hotspot option, there is no “Set Up Wi-Fi Hotspot" option. I see a screen that tells me the hotspot SSID and password, but there doesn't seem to be a way to change either. Open Settings, then select Mobile Data. Tap Personal Hotspot, to toggle Personal Hotspot to the ON (green) setting. If Wi-Fi or Bluetooth are turned off, iOS will prompt you to turn them back on. You don't want a hotspot that's limited to a USB connection. Now go to the computer or other device that needs to connect to the hotspot. On Windows, click on the Network icon in the system tray and choose the hotspot’s name. On a Mac, click Network in the System Preferences window, and select the hotspot. Enter the wifi password (the one you just created on your phone) when prompted. It's a good idea to turn off the mobile hotspot when you no longer need it. See my notes above concerning data charges. Most recent comments on "[HOWTO] Make a WiFi Hotspot With Your Phone"
On many older data plans (for example, my old AT&T plan), the carriers disabled the Hotspot feature on my phone. Most newer plans have at least some Hotspot capability but with limitations. For example, on my current T-Mobile plan, I get unlimited data (throttled after 50GB) but only 10GB of high speed Hotspot usage. As you said, I never have an issue since I only use it rarely at a hotel, Airport, or some place where I can't get Wi-Fi. It looks like it is far easier to do this on an iPhone. 3 steps really (I usually keep my wi-fi and bluetooth enabled, but even if I didn't the prompt would tell me, as opposed to 6 for android. I personally have never seen anything about Android phones and certainly not their app selection that would convince me to switch. I just feel a little silly for not having known this before. It's not difficult to use and works fine. I ran into the speed throttling issue with Verizon. Long story short, I have an unlocked Android phone (Moto X4) and switched from a Verizon pre-paid plan to their post-paid "Unlimited" plan and was rewarded with an extremely slow hot spot to the extent that it was unusable. I eventually determined that at this point they don't throttle the hot spot on the pre-paid plans so switched back. There's a lot more to the story but... Suffice it to say that Verizon does not play well with unlocked phones on their pre-paid plans. In my opinion, it is ridiculously limit hotspot use in an unlimited use. Unlimited means unlimited. I agree with your comment "You don't want a hotspot that's limited to a USB connection". On the other hand there are occasions when a USB connection is useful. First, the USB connection powers the phone from its host. This addresses your comment: "Hotspot mode consumes a lot of power". Second, when connecting my laptop by wireless connection gets flakey, I switch to USB and it always works. Many carriers (such as mine, Cricket) do not allow you to make a hotspot using your phone, unless you have a certain data plan and/or pay extra to make the hotspot. I rarely use even 1.5 gigs a month, although I have 5 with my plan, but I cannot share it with my computer or my tablet--at least legally according to the carrier's terms. A reader says "I personally have never seen anything about Android phones and certainly not their app selection that would convince me to switch." Considering that Android has 85% of the phone market, that admission hints that this reader did not do their homework before purchasing and just fell victim to Apple's iPhone advertising and their significantly higher pricing. cWindows 10 Phone, go to Settings, Wifi, and then Mobile Hotspot. I cannot turn it off as my carrier, Cricket (AT&T the inexpensive version) has apparently turned it off. However, on my wife's Android, also using Cricket and on the same plan as I, can be set to Mobile Hotspot. Oh well, just another thing the Windows Phone cannot do. What it does, it does well, but the world (software developers) does not support it. I prefer my own hotspot to any publicly available WiFi every time. Although sooner or later someone will work out how to snoop on the cellular connection! Any carrier that only lets you use the data you've paid for in ways that they approve of needs to be dumped. If you're using a prepaid carrier such as Puppy Wireless or Cricket you need to use the app PdaNet to connect your phone to a tablet or computer. In your instructions for "Creating a Wifi Hotspot on iPhones" you say "Open Settings, then select Mobile Data." In my iPhone 6, ios 11.4.1, there is no "Settings>Mobile Data"
T-Mobile International plan allows unlimited data for one's phone and unlimited data for the computer connected via hot spot. Neither is there any speed reduction after x GB of usage. I've used mobile phone hotspots as sole means of internet since 2010 and the iPhone 4. I moved to Android with next phone. I had to get mobile carrier to enable hotspot functionality with some of my providers. I connect up multiple devices daily. Auto-generated passwords by Samsung and Apple are only from a 50,000 or so variations so can be hacked by determined hackers with the right gear but for few hours a day; don't stress. With a $40 AUD plan giving 15 GB/Month for me and another 15GB for my wife we never need more data. Say goodbye to landline phone and internet if you live in town and aren't a high data user. 4G speeds are fine! Can't wait for 5G. Russ; I've got to agree with you about Windoz phones. Never had an Apple. With the ability to install apps on exterior storage in Windoz mobile, that feature hands down beats Adroid. The one feature Windoz phones (except the costly high end phones) left out that ticked me was- mirroring. I'll bet there are lots of P-Oed Windoz phone users.